Don't say this forum doesn't have influence...for some reason ever since I first saw this thread some time back, I couldn't stop thinking about this comment. Back some years ago (I wasn't a kid, but felt the same way) I had the Carlton rookie, but got rid of it at some point. So, this came in the mail today. 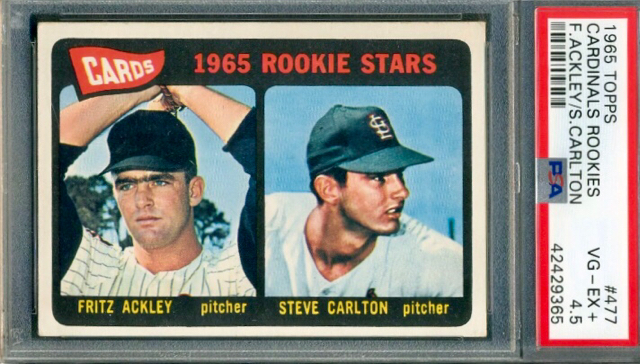 Wow, a Steve Carlton rookie!!" Not o/c, but lower grade and cool nonetheless! Of course, I love this post. Am curious what you guys think is better if you're trying to sell a card. I requested no qualifiers when I submitted this to PSA and ended up with a 2.5. I've definitely seen uglier specimens than this get 4s, so I'm wondering if I would have been better off with something like a 4 (O/C). Well, they gave it a 2.5 due to the wear, not the centering. So there must be some creasing that's not visible or back damage. Presents really well, and it's better for the registry and for resale value (IMO) to be in the 2.5 slab. Thanks. Back is clean. No creases, but there is one very small area along right border that has slight indentation. If that's the case, I'd probably send it in for review. Could easily be a 3.5-4 IMO. At least with a review, if it didn't bump, they'd give you the reason it only got a 2.5.